Humans have always been fascinated by eclipses. In many ancient societies, eclipses were considered ill omens for kings, “unnatural” and frightening events that could weaken or dissolve the bonds of peace and kinship, leading to political upheavals. Other societies believed that eclipses held healing powers for the sick, or represented an opportunity for warring parties to make peace and put all their old hostilities and disputes aside. Although most of us no longer attribute spiritual significance to them, we remain fascinated by eclipses. To some, an eclipse is simply a rare event not to be missed, a pretext for adventure. To others it may hold astrological significance — perhaps some clue to future events or their life’s meaning. On August 21st, darkness will creep over us, but after a few short minutes the light of day will return. However, we all know that life’s sorrows can bring darkness that lasts much longer. Most of us, laugh though we may, can relate to this melodramatic song. Who hasn’t suffered deep, painful disappointments in life…loneliness, depression, or loss of hope? For many of us, the wounds and disappointments are very deep and persistent. We look in our own hearts and at the world around us, grieved and puzzled at the darkness we find there. Jesus faced the darkness that results from humanity’s selfish, wicked sin to return us to the Light that is the very presence of the Creator. He died saying, “Father, forgive them” and rose from the tomb three days later, bringing “life and immortality to light” forever, for all who repent and believe (2 Tim. 1:10). We cannot overcome the darkness of sin any more than we could stop a solar eclipse. But Christ Jesus has overcome the darkness, and He can do it for you now. He is closer than your next breath. Jesus said, “Come to Me, all who are weary (worn out by life) and burdened (under a load of darkness, guilt, shame and sin) and I will give you rest” (Matthew 11:28). Do not suffer in darkness another day. Contact us if you would like to know more, have questions, or would like someone to pray and talk with you. 1.Total Eclipse of the Heart, written by Jim Steinman. Performed by Bonnie Tyler and released on Columbia Records, February 11, 1983. Where there is no vision…? I recall visiting a rural church in the American South several years ago that had a banner stretched across the back wall of the sanctuary behind the pulpit. “Vision 1000!” it read, and I later asked the pastor what it meant. With a puffed chest and a wide smile he declared, “We’re believing for a thousand people to worship God out here in the country!” Based upon the traditional King James translation of Proverbs 29:18, this pastor felt that the Bible demanded that his flock have a tangible, measureable growth goal to work towards – a vision, if you will. Thinking about the problem of evil and sin, have you ever asked any of these questions? For these and countless other questions, one must return to Eden and the events of Genesis 3, to consider the possibility that the Hebrew text therein suggests such incredible and disturbing things, that one must set aside doctrinal theories and theological systems to understand the literal blood struggle between the Holy Creator God/YHVH and the being of chaos/disorder/darkness known as Satan. This event in Eden appears to be the foundational element in understanding the plan of God/YHVH throughout time, as shown in the Scriptures. It is the goal, or it should be the goal, of every serious Christian to learn to effectively study the Bible. Effective Bible study can be defined as the ability to do independent research in the Bible without the aid of commentaries. Hebrew is the foundation stone on which the Old Testament revelation was given to man. This was the linguistic vehicle that God chose to reveal Himself and His plan, for not only the Jew, but also for all of mankind. It is an accepted fact that a person cannot study the Old Testament in depth without a working understanding of the language of Hebrew. The same could and should be said about the New Testament because of certain facts that remain constant. Every single writer of the New Testament, with the possible exception of Luke, was a native speaker of a Semitic language. The Bible, both Old and New Testaments, is a Jewish manuscript. It is a book written by Jews, to Jews, not only pointing the way for a Jewish Messiah, but also showing how Jesus fulfilled the role as the Jewish Messiah. It is impossible to separate the way a person thinks from what he writes. It can be said then that the New Testament is Hebraic thought that has been clothed in Greek garments. In order to effectively see these thought patterns, a person must have at least some ability to handle Hebrew to unlock the rich storehouse of knowledge that is available to us as we study the New Testament. For the print/paperback version, click here. 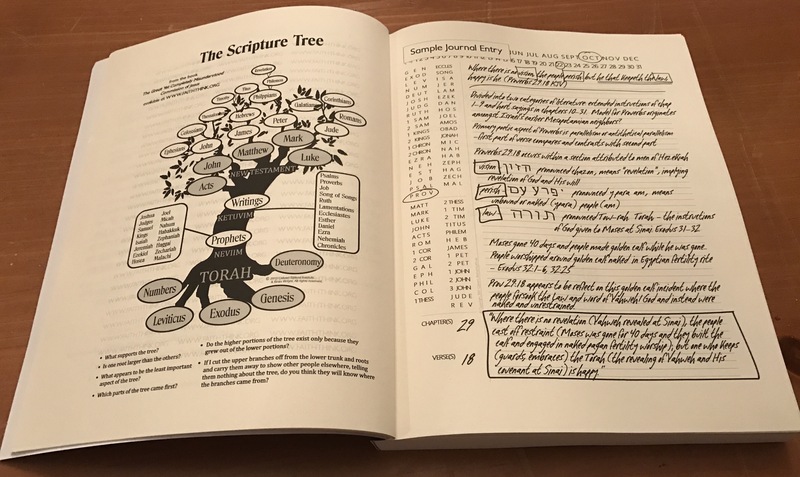 Here is a sample of note taking in the new Calvert Bible Study Journal. Check it out! This is a test of the new FAITHTHINK WordPress blog. This is only a test. If this had been an actual posting, it would have contained actual useful and pertinent information. Calvert Biblical Institute is growing our media presence! In January 2017 we are rolling new WordPress and Tumblr blogs. Both of these will connect with our Facebook and main website, http://www.faiththink.org. Check back often for updates!